EIT Food main mission is to support innovative and economically sustainable initiatives which improve our health, our access to quality food and our environment. Being part of the EIT Food, BGI has been tasked to develop and facilitate projects that have an impact on EIT Food's goals. Reveal your talent in agrifood sector by getting a unique internship. MSc students and graduates with different educational backgrounds as well as PhD students and post-docs from 28 European countries will discover job opportunities in the food industry, by getting a unique, professional, paid 3-6 months internships. If you want to be one of them, keep reading. The Innovation Prizes competition is one of Europe’s largest startup competitions in the agrifood vertical. The Innovation Prizes are awarded to entrepreneurs and early-stage startups to support the development of new products and services which can help transform our food system; making it healthier, more sustainable and more trusted. This year, the Innovation Prizes are open to entrepreneurs and startups from across the whole of Europe. Excitingly though, there are additional prizes available for entrepreneurs based in Eastern and Southern Europe, through the Regional Innovation Scheme (RIS). Apply for an Innovation Prize and receive up to €10,000 of equity-free funding. EIT Food RIS Venturing School from 23rd to 29th of May 2019 in Olsztyn, Poland. Do you have an idea that could transform the agriculture, fisheries and food sector? Apply for an Innovation Prize and receive up to €10,000 of equity-free funding. EIT Food is on a mission to transform Europe’s food system – making it better for people and the planet. Working with entrepreneurs, innovators and the wider community, EIT Food is changing the way we produce, process, distribute and consume food. In the seventeen live finals, there is a €10,000 and €5000 prize available. There are fifteen live finals for applicants from RIS countries (one per country listed below); and general live finals for all other applicants. In addition to the cash prizes, participating startups will benefit from access to investors, high-quality training and our community of mentors and experts. Participants will work in interdisciplinary teams, identifying problems, prototyping viable solutions with a validated value proposition and pitching their projects in front of a panel of experts. aged at least 18, are welcome to apply for the EIT Food RIS Venturing School. There is no precondition concerning study background. 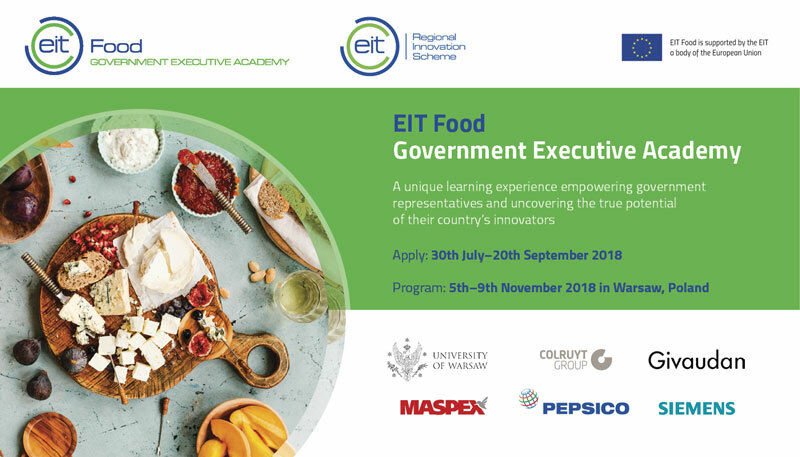 EIT Food Government Executive Academy will bring together 39 government representatives from 13 RIS countries with experts working in the field of agri-food innovations from industry, academia and European institutions. If you think you should be among them, apply here EIT Food GEA is a week-long training program that offers insights into challenges related to food system innovations and regulations. It is also an opportunity to exchange best practices that will contribute to further improvements of Research & Innovation Smart Specialisation Strategies and inspire the future development of operational programs based on the EU Structural and Investment Funds. Satean Foundation and the European Institute of Innovation and Technology (EIT) are organising a conference to discuss the future of innovation in Europe with relevant national and international stakeholders. You are invited to participate in the event, meet representatives and contribute actively to the discussions. Participants will have the opportunity to meet representatives of the six EIT Innovation Communities, will learn about the EIT Community’s results and activities, and how to get involved with the EIT. Participation is open to innovators, public organizations, researchers, students, entreprises and general public. Location: Dunarea de Jos“ University of Galati, Romania. Agenda: More information including t will be made available in due course. RIS Innovation Grants is a business creation activity in the framework of EIT Food RIS. Grants are awarded to support the commercialization of novel products, services or business models which make the agri-food sector more innovative, especially at the local level. The applications will be scored by a panel of judges. The ten startups with the highest scores all be invited to Romania EIT Food DemoDay. This will be an open start-up networking event, where selected applicants will present their idea in a form of 3 min pitch presentation + 2 min Q&A part in front of a selected jury who will pose questions and will rate the performances based on specific criteria. The prizes will go to the two teams with highest scores after the written and Demo Day performances have been combined. - Applicants cannot have received more than 60,000 Euros from EIT Food and its other programmes to support agrifood startups/entrepreneurs. - Only candidates who submit a complete application, answering all the questions on the platform will be evaluated by the reviewers for the second stage of the competition – EIT Food Demo Day. Fullfill the application form until the 30th of September - click on the buttom Apply. If you are one of the ten startups with the highest scores from each you will be invited to pitch at EIT Food Demo Day, at Galati, on the 13th of November. The RIS Fellowships project is dedicated to students and graduates of Msc., with different educational levels, educational and professional background, coming from different universities from 13 RIS countries. Gain hands-on experience and strengthen your job-related skills during a 3-month internship in a company from the food sector. The internship is focused on cross-country mobility meaning you will carry out your internship in a host company outside your region of study or origin. Various companies across Europe and Israel are looking to host young, creative minds like yours. You can find the list of companies here: http://timo.wz.uw.edu.pl/risfellowships/#inter Selected candidates will be matched with a host company outside their region of study or origin according to their interests, background and skills. Candidates must study or come from one of the following countries or regions: Croatia, Czech Republic, Estonia, Greece, Hungary, Italy (only regions of: Basilicata, Calabria, Molise, Puglia, Sardegna and Sicilia), Lithuania, Poland (only regions of: Dolnośląskie, Kujawsko-Pomorskie, Łódzkie, Lubelskie, Lubuskie, Małopolskie, Opolskie, Podkarpackie, Podlaskie, Świętokrzyskie, Warmińsko-Mazurskie and Wielkopolskie), Romania, Slovenia, Spain (only regions of: Andalucia, Canarias, Cantabria, Castilla-la Mancha, Extremadura, Illes Balears, La Rioja, Principado de Asturias and Región de Murcia), Portugal, Turkey Candidates must be Msc students (min. completed the second year of study) or Msc graduates (up to 2 years after graduation) in a relevant field (see relevant fields below) Candidates must be able to work in the English language (min. C1 in CEFR level of English is required) Candidates must have a LinkedIn profile in English, Candidates must apply via 1 of 13 RIS Fellowships group on LinkedIn Candidates must be available during the period from August until November 2018, Candidates must be interested in the agri-food sector, Candidates must have health insurance required for cross-country mobility.